The vitamin B12 test measures the B12 blood level. What is a B12 blood test? Why is a vitamin B12 test important? The B12 blood test is helpful for screening for a vitamin B12 deficiency. This Vitamin B12 Test is a blood test. The B12 test, also known as a B12 blood test, vitamin B12 test, B12 deficiency test, and B12 lab test, measures the B12 blood level. Vitamin B12 is a water-soluble vitamin that is one of the eight B vitamins. Sometimes known as cobalamin or cyanocobalamin, vitamin B12 has a wide range of roles in the body. Humans are unable to make B12 and, as a result, all dietary B12 must come from sources such as animal products or fortified foods. Additionally, B12 can be made synthetically and B12 intake can come from oral or injectable B12 supplements. Vitamin B12 is essential for cell health and red blood cell production. Vitamin B12 deficiencies are thought to manifest in a variety of symptoms. Because it is important for red cell health, a vitamin B12 deficiency can lead to anemia. Vitamin B12 deficiencies are also thought to cause fatigue, weight gain and suboptimal nerve function. Medically-identified causes for a low B12 level include pernicious anemia, surgical removal of parts of the gastrointestinal system and rare metabolic disorders. Vitamin B12 deficiencies are often found with folate deficiencies which is why the B12 lab test and folate test are often performed together and are both part of the vitamin test panel. To get a vitamin B12 blood test at a Quest Diagnostics near you, simply order online and get tested at your selected lab location. Once your B12 lab results are ready, the report will be available for electronic download. As can be seen on the vitamin B12 sample lab report above, the B12 blood levels are reported as a numerical result and can be compared against the B12 reference range provided by the lab. 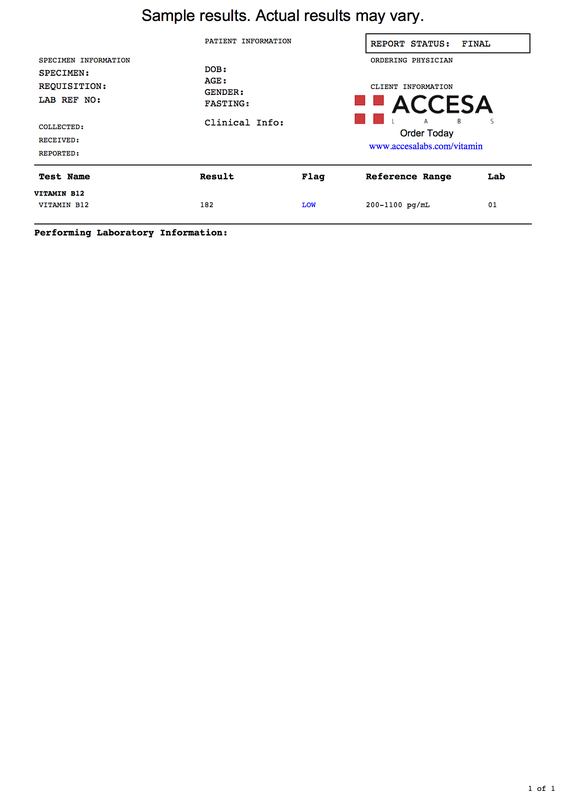 This vitamin B12 lab test uses an immunoassay methodology to measure the B12 cobalamin blood level. An overnight fast of 8-12 hours is recommended prior to getting a B12 blood test. For additional information about a possible B12 deficiency, the B12 blood test is sometimes performed along with the methylmalonic acid test. This B12 blood test can be found in the anemia blood test panel. Vitamin B12 Test at Guaranteed Prices.